Choc banana bread recipe | Gluten free, grain free, refined sugar free. This is Merrymaker Mum’s paleo banana bread recipe but with a few changes and we added chocolate. So it wins! It’s gluten free, grain free, refined sugar free. Made with butter but you can swap to coconut oil and make it dairy free. But we vote to try it with butter! 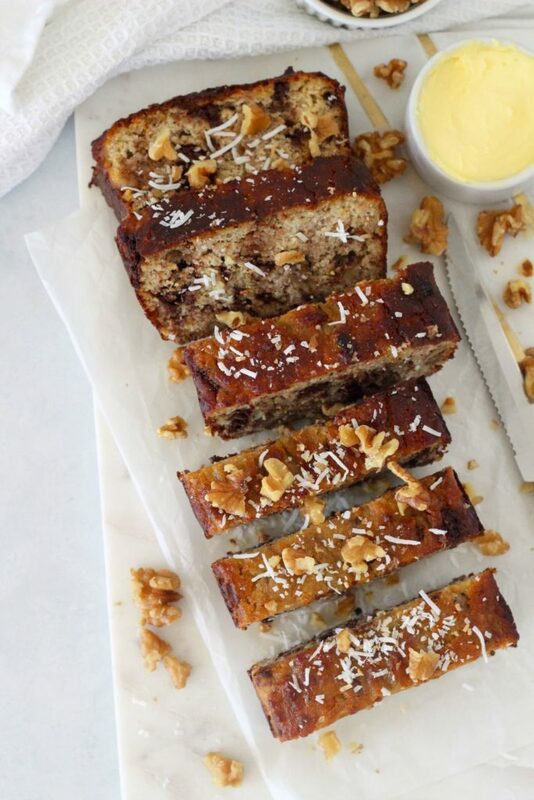 Who doesn’t love banana bread?! Well if you have that one weird friend who doesn’t, serve them this recipe because it has chocolate in it and surely they will be converted to join the healthy banana bread lovers club! For the chocolate, we used raw, refined sugar-free chocolate but if you can only get your hands on regular chocolate go for the highest percent dark chocolate. Also… if you can’t get the eggs and butter creamed nicely and the butter is still chunkster when you mix it try and mash the butter with a fork. 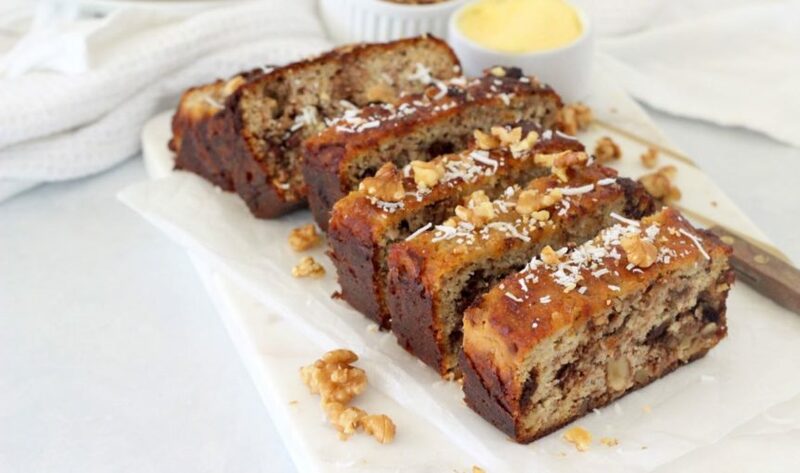 Before you slice it, wait for the healthy banana bread to cool! We know… this is really hard! You really want to try it NOW! But trust us, patience is your best friend. Even cooling it in the fridge for 30 mins before slicing will get that really clean slice. If you make it let us know! Send us a pic of your healthy and Merry creation on Instagram or Facebook or Pinterest (check out our droolworthy boards HERE). Ps. 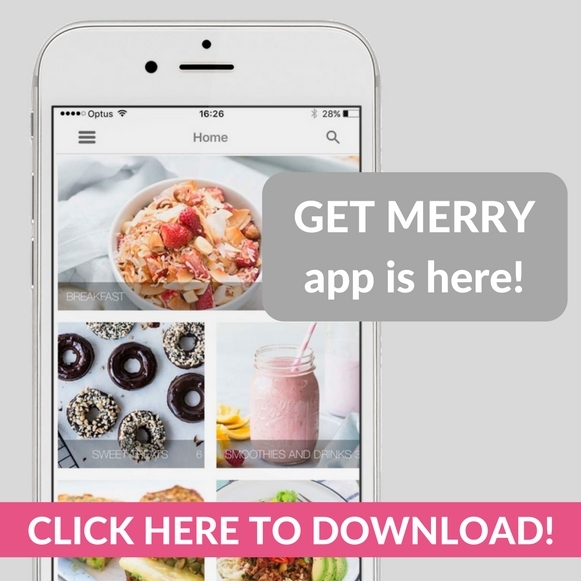 we add ALL our recipes to the Get Merry app. It’s the most convenient place to find them! Plus we add special app exclusive recipes to the app all the time. 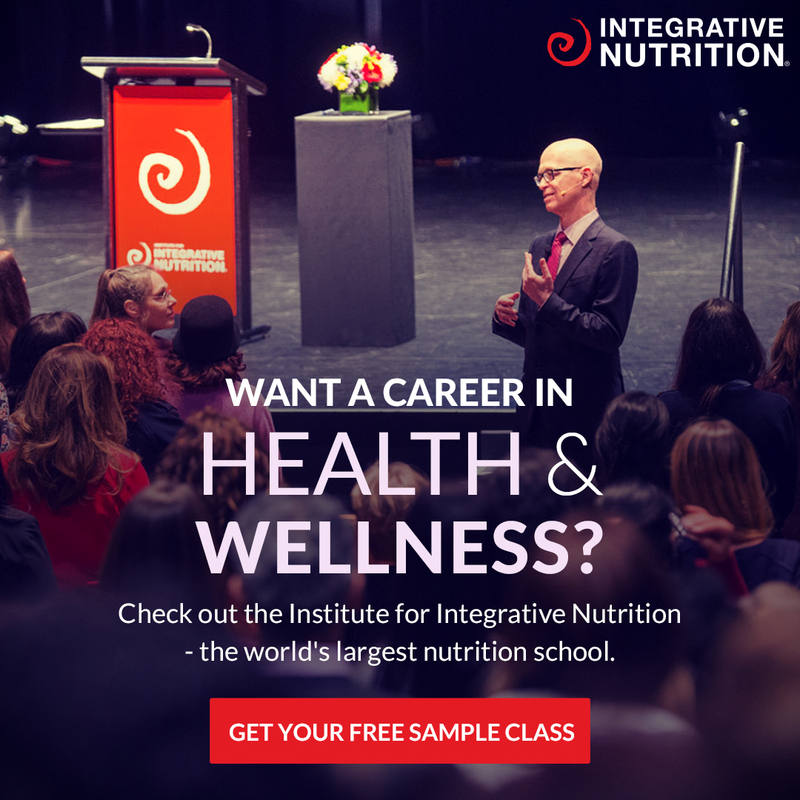 You can learn more about it HERE. Preheat oven to 180°C (350°F) and line a 20cm x 10 cm (8 x 4 inch) loaf tin with baking paper. In a small bowl mash your bananas, set aside for now. In a mix master cream the butter, eggs, honey and vanilla. In a large bowl mix the almond meal, walnuts, chocolate and baking powder. Add the butter mixture and mashed bananas to the large bowl with the almond meal mixture and stir until combined. Transfer the mixture into prepared tin and place into the oven for 40 minutes. Take out of the oven and allow to cool completely before you turn out and slice. Serve warm with extra butter. This loaf freezes really well... but it never lasts too long.